With over thousands of trekking trails and destinations to choose from, Annapurna Base Camp is one that has been loved and highly picked by trekkers and adventure enthusiasts around the world. This miraculous trek to the Annapurna Base Camp lying at the altitude of 4130m will refresh your souls and ignite a sense of zeal and enthusiasm as an adventurer. The Annapurna Base Camp trek quintessentially stirs folk culture, majestic Himalayas and thrilling trails, which is why it is one of the most trailed routes all over the world. 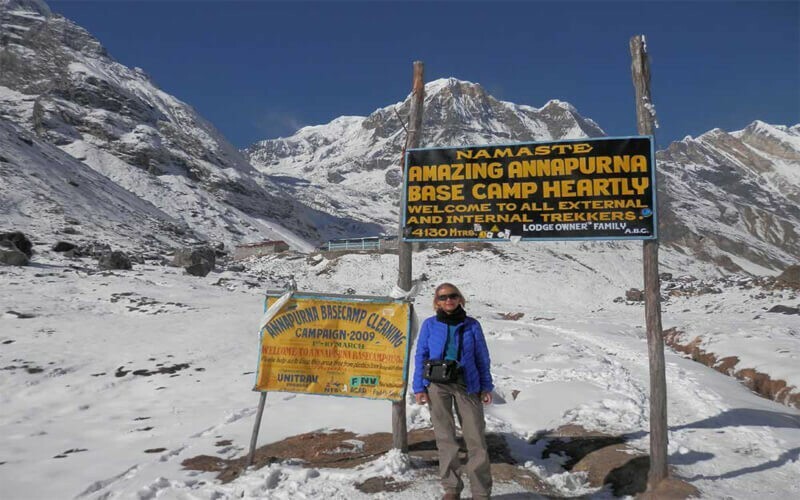 The Annapurna Base Camp is the paramount destination in the Annapurna region. The journey to the Annapurna base camp unfolds at the absolutely vibrant tourist hub, Pokhara. Along the way, nights are spent at villages of Ghorepani, Tikhedhunga, Chhomrong and several other villages where one is guaranteed to encounter the kindest and warmest villagers. The Himalayas have been known to notoriously alter their weather in mere seconds and the same applies to the Annapurna region. In this case, the Annapurna Base Camp is no exception, with the weather wavering in minutes. As for when it is best to undertake this moderately difficult trek, it is during the months of September to November and from March to May, autumn and spring seasons respectively. As you get to the Annapurna Base Camp, the fluorescent and dazzling snow below your feet and surrounding you all around, with the colossus Annapurna range welcoming you will truly be a sight to behold and gaze upon. The Annapurna region is home to several ethnic tribes of Brahmins, Gurung, Chhetri, and Magars are where cultural diversity begins and thrives. With a more diverse culture in the Annapurna region, the Annapurna Base Camp trek gives off a different vibe if one wishes to explore locally. With terrace farms and farming communities clinging on to the hills, life is pretty primitive in this part of the region. The Annapurna Base Camp is not only about the Himalayas but so much more beyond that. Blossoming rhododendron woodlands, canopies of oak forests and terraced farmlands are what makes the entire trek more enthralling. A key factor as to why the Annapurna base camp is the highest trailed route all over the world is because of the holistic package that it is. The Annapurna Base Camp trek is packed with cultural integrity, an abundance of frondescence and undeniably the glorious towering Himalayas as the backdrop of the entire trek. It goes without saying that our hearts and souls are at peace when we meet strangers that treat us like friends for years. 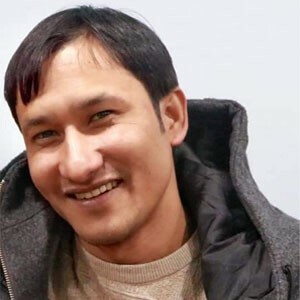 Nepalese have been well known far and wide to be the most helpful people and be all smiles despite several hardships. Undoubtedly, this has brought abundant love and respect for the Nepalese. With the tourism industry booming, the Nepalese have brought it to their favour economically. Hence, hundreds of tea houses and snug lodges have opened up in the Annapurna region in recent years. Another reason for the Annapurna Base Camp being a top destination among trekkers is because of the easy and varied accommodation services that one can choose from. Not every adventure enthusiast is going to be necessarily physically fit. With gentler descents and an overall moderate altitude, 4130m being the highest, Annapurna base camp trek is a trek that isn’t very gruelling and demanding on the knees. Eventually, it is safe to say that the Annapurna Base camp trek is a perfectly moulded package with equally thrilling views. It sounds perfect, doesn’t it? Halfway through the trek, a galore of snow-capped mountains grace the trails. The 360-degree panoramic view is such a delight to the eyes that they seem as though they’ve been carefully handpicked and put in place. The Machhapuchhre, Mt. Hiunchuli, Annapurna South, Annapurna I, Annapurna III and Gangapurna are few of the massifs that receive trekkers with open arms. However, the fun isn’t over yet. The Hot springs at Jhinu are trekker’s favourites to unwind and rejuvenate after the strenuous trek. A bottle of cold beer and gossips with fellow trekkers is ideal to loosen up your mind and body. 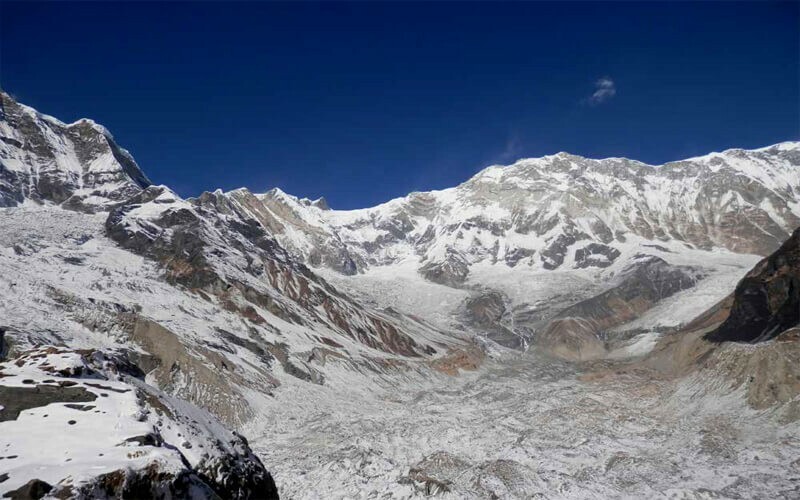 We, at Frolic Adventure, are your perfect guide to the Annapurna Base Camp Trek. Our team of trekking experts, enthusiasts and guides are dedicated to making your trek to the Himalayas a memorable and joyous one, where you will be overcome with enthusiasm and excitement to undertake and avenge the Annapurna’s once again. Frolic Adventure always and takes our word, always prioritizes the safety of our clients and nothing is more important to us that your wellbeing as long as you are in our hands. As we show you the best of trails and the most amazing views, your journey to the Himalayas is going to be a fulfilling one with us as your travel partner. In order to make complete your journey in the best way, Index Adventure has the best logistic and an exceptionally excellent team of guides. Undertake your trek with Frolic Adventure with the safest hands and create bonds and memories of a lifetime.